It’s not Christmas in Spain until people start lining up to buy their lottery tickets! The “Loteria de Navidad” is Spain’s Christmas Lottery. The drawing takes place on the morning of December 22nd with children singing out the numbers stamped on small balls which roll out of a gigantic bingo-style ball. There are literally hundreds of winning numbers for the Christmas lottery in Spain. Some are BIG winners and some are small winners but I don’t know how the winning amount is assigned to any given number. By the time the Christmas lottery tickets are available is about the same time LONG LINES begin to form to buy them. 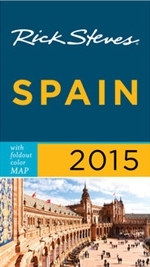 Puerta del Sol and Gran Via lottery offices are the busiest, probably because they’re in the downtown. But also, theses locations are considered to be considered “Lucky” because that’s where patrons have been buying their Christmas lottery tickets for years and years. Apparently it’s a custom in Spain to buy Christmas lottery tickets whenever visiting another city or town. It’s another custom to buy and gift lottery tickets as Christmas gifts to your friends and family. This year is the first time I’ve bought Christmas Lottery Tickets here in Spain. Why not join in the tradition? I realize lotteries are a total waste of money and the odds against winning are worse than getting hit by lightning on a sunny day. But why not? It’s tradition and I’m a new-ish Spanish resident. 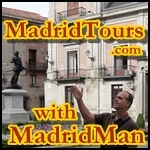 I’d seen the lines going down the street at Gran Via outside of Madrid’s most famous and oldest lottery offices; “Doña Manolita” – founded in 1931. It seems to be a pretty festive atmosphere for those waiting, many of whom are smiling and talking with other patrons about what they’d do with the money should they win. The Christmas lottery tickets are sold in “Decimos“. Each lottery ticket carries FIVE NUMBERS. And each individual lottery ticket is sold as ONE TENTH of the whole ticket. Confused? I’ll explain – if I can. Each Christmas Lottery Ticket has one number. But each NUMBER carries a total of 10 INDIVIDUAL tickets. Each ticket costs 20 Euros. To buy the ENTIRE set of 10 tickets for any given lottery number you’ll pay 200 Euros. That’s 10 Tickets X 20 Euros = 200 Euros. I don’t think they print out the tickets with your chosen number but they do have stacks of different of numbers from which to choose. Often people will choose a ticket which ends in “7” because it’s their lucky number. Or they’ll choose “65” because it was the year they were born. Knowing the lines were long downtown I instead chose one of the lottery commission offices here in my neighborhood. I got there at about 5:45pm, hoping the line wouldn’t too long after re-opening after the lunchtime break. IT WASN’T! In fact, there was ONLY one person at the window when I arrived! What luck! LUCK!?!?!? Hmmm.. That MIGHT have been a sign. hehehe… So I tell the name behind the plexiglass window that I wanted to buy a lottery ticket. He asked, in Spanish, “For Christmas?” “Yes.” So I chose the ending numbers which I felt where “lucky”, the man zipped them off of their perforation and handed them to me in exchange for my 40 Euros. 40 Euros thrown out the window! Well, we’ll see. But remember that since I bought only a “Decimo” – or one-tenth of one ticket, say if my number wins and the jackpot for that particular number is, for example, 20,000 Euros. One-tenth of that is, of course, 2,000 Euros and that’s what I’d win. There are people who buy the entire 10-set-tickets for 200 Euros but not me. I’m not that well off! 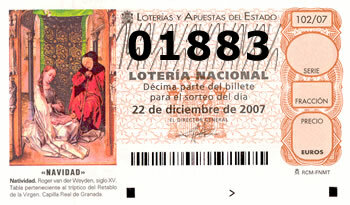 This entry was posted in About Spain, Money and tagged 2007, Christmas, Christmas Lottery, Loteria de Navidad, Loteria Nacional, Lottery, Madrid, Spain. Bookmark the permalink. Such an interesting cultural practice they have going on there. Cant wait to experience it when I finally move there.